Riders paint a picture of spilled beer and coffee on train floors, and food grime on seats and windows. The Long Island Rail Road counters that it has hired more workers and cleans trains more than in the past. The Long Island Rail Road, just months after promising to ramp up efforts to keep trains clean, is fielding complaints from riders and its own workers about trains being filthy. The accounts of spilled beer and coffee on train floors, food grime on seats and windows, and bathrooms overflowing with sewage come as the LIRR — under pressure by the Metropolitan Transportation Authority to cut costs — scales back a plan to increase train cleaning efforts. The LIRR said its "car appearance maintainers" clean each of the railroad's 115 train sets about 4.5 times a day. 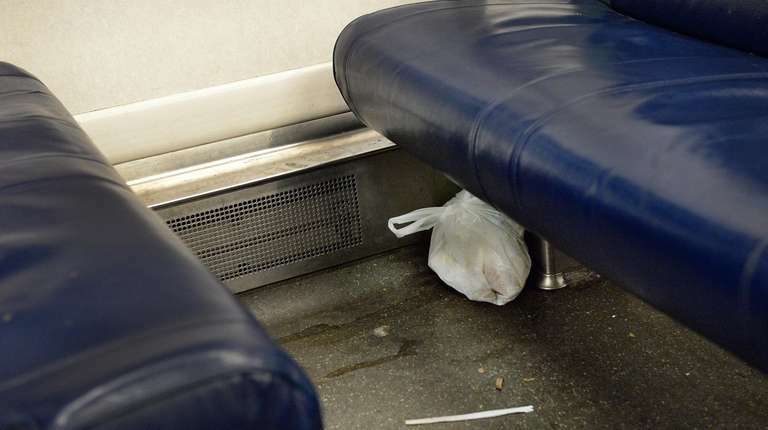 It also comes as the railroad continues to carry a record number of riders, including some who, according to fellow commuters, think little of leaving their trash behind when they step off a train. 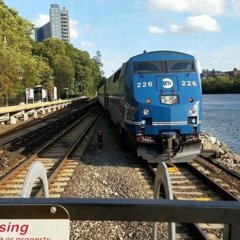 The LIRR carries close to 300,000 riders on an average weekday. Although the railroad said it has increased its number of car cleaners and the number of times trains are cleaned each day by about 5 percent, many commuters said they haven't noticed a change for the better. Tony Arroyo, 49, of Long Beach, similarly called his LIRR commute “absolutely disgusting,” and said he’s sometimes reluctant to put his luggage on the floor of a train out of fear of what might get on its wheels. I noticed the windows on the LIRR M7s are very dirty, some are so dirty that when you look out of it, everything's a blur smh. I read about the toliet overflowing into the passenger area on Twitter, yikes. The LIRR is the worst in terms of cleanliness,. Metro-North is so much better. - The one breaux (bro) that came out the bathroom with 2 of his other breaux.... ughk.... well let's just say from the waist down, a newspaper wasn't the only thing black, white, and red all over on that dude.... Needless to say, that ***ed up my whole day that day.... If you're gonna do some experimenting, do so in the privacy of your own.... Oh, forget it. - As alluded to above, the guy that #2'd on the walkway to look cool in front of his friends (I guess).... A fight actually broke out between another passenger & the friend of the dude that did the do (doo) on that train that day..... While I think shitting in public is obviously downright nasty, I don't care that much to want to fight somebody over it out of GP, if none of it touches me or my personal belonings.... An LIRR train is not my personal possession... Sorry, not sorry. - Numerous couples expressing their lust, interpersonally (I think I mentioned one instance of it on here - and that was during the workweek, on my way to work that day)... Karma karma karma karma karma..... Sutra? - IDK who was really with who, or how it started, but from what it looked like, two separate sets of breaux's were spitting back & forth at each other (and I'm not talking about reciting rap lyrics either).... This led to a chick's broken nose (not sure how she fell, but she faceplanted somehow tryna break up the... spat ) & cheap beer being flung throughout the middle of that particular subway car.... Not that this matters either, but it's always the skunky, cheap stuff ! - The food of choice that's often left behind for whatever reason, are pizza's.... The individual slices sometimes still in the boxes, sometimes on the floor... On the seat, under the seat, on the floor, on the overhead rack, back over by the c/r's area, whatever...﻿.. 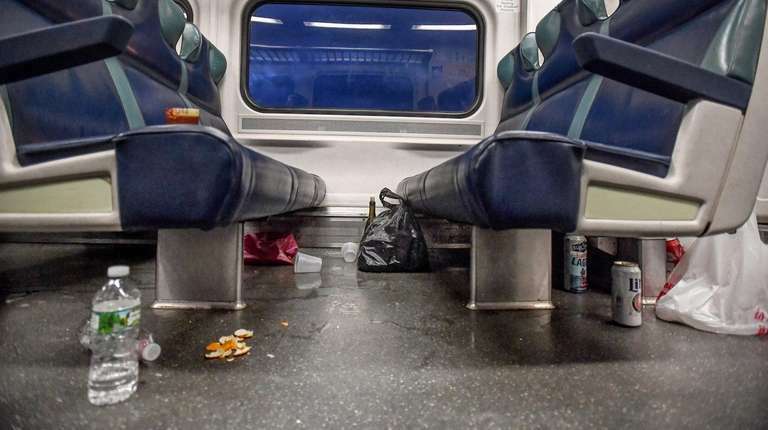 Whenever I've taken the LIRR to visit clients of the island or for business dinners, I have not been all that pleased with the cleanliness to be honest. To me the LIRR is nothing but an overpriced subway. Ghetto, dirty, etc. Metro-North is much better in that regard. Yes, driving does take it's toll, especially with these horrible streets out here. I have a friend who lives in Mineola and works on east side of Midtown who got so fed up with using LIRR that they drive to take QM31, QM35 or QM36 bus at 188 Street and Union Turnpike stop. They told me that Fresh Meadows near bus stop has no alternate side parking and is free and they are not just saving money on $261 monthly LIRR ticket, but on paying for parking and paying for Metrocard separately from the train ticket. This friend told me so many horror stories about the LIRR and they told me the express bus riders are much more civilized and less entitled than LIRR riders. With my experience with LIRR, I totally understand my friend and I have been on many express and local bus in Queens. .....the middle of that particular LIRR rail car. The horrible drivers out here also.... Rivals NJ. Cleaners (of any sort) in this country get a raw deal..... You couldn't pay me enough to clean up someone else's excrement... someone else's love juices (lol).... someone else's, anything that's capable of being emitted..... IDC if you give me a hazmat suit or an astronaut's suit either! "This.... is a Manhattan bound lerrr train... The next stop is... _____________ ..... Stand clear of the closing doors, bro"
Don't forget the automated reminder "As a courtesy, please vomit away from the other passengers' feet"
Pick up your trash and put it in the station trash receptacle. Please vomit in the bathroom. There is no assigned seating please don't hold or save seat and don't ask people to move from their seat because it is the seat you sit in every day. No smoking and that includes e-cigarette, traditional cigarette, weed. Keep your hands to yourself and there is no sexual activity allowed. No harassment of train crew or other passenger allowed. Shirt, pants, and shoes required. The commuters complain about the dirty trains as if the dirt and the garbage appears out of thin air. Gimme a break. Nassau/Suffolk patrons need to wake up & smell the "cawwfeee".... It's THEM. Those same LIRR employees tell LIRR riders that if they don't like LIRR, they should go drive. I was even told that LIRR employees say among themselves that the public should go shut up and let the railroad employees do their job. LIRR has the worst customer service of any MTA agency and has worse customer service than NJT.